The Costanoan Indians inhabited the region for more than 3,600 years. Most of the Indians eventually succumbed to disease introduced by soldiers and missionaries, and Big Sur remained relatively devoid of inhabitants until the 1860s, when the first western pioneers arrived on the scene. William Brainard Post, an 18-year-old Connecticut Yankee, stepped off a ship in Monterey in 1848. A spirited explorer and entrepreneur, W.B. Post spent his early years on the California coast hunting grizzly bear and deer. He later traded in his buckskin and became a businessman, starting the first grain warehouse in Moss Landing and the first butcher shop in Castroville. In 1850, W. B. married Anselma Onesimo, of Costanoan descent, with whom he had five children. When he took out a claim on 160 acres of land in Big Sur, he became one of the region's first homesteaders. With the help of his sons, he built a cabin. The red New England-style house, a registered historical landmark, still stands on Highway 1 across from the entrance to Post Ranch Inn. The Post family raised cattle and hogs and exported apples from a thriving orchard. W.B. and Anselma's youngest son, Joe, married Elizabeth Gilkey, a neighbor of Cherokee descent, and eventually bought up claims from both of their families, accumulating nearly 1,500 acres, including the area of Post Ranch Inn. Together the adventurous couple ran the ranch and acquired the wilderness around Big Sur. 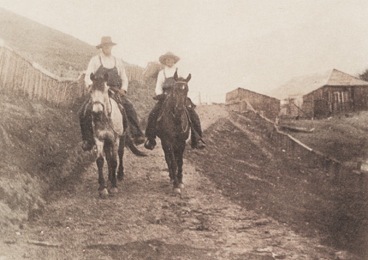 Their son Bill continued the family tradition of leading trips and working as a cowboy and rancher. 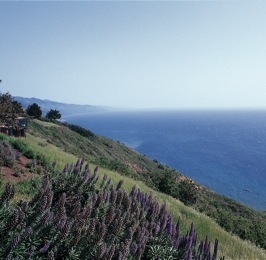 While carrying mail from Monterey to Big Sur, Bill met Irene Fredericks, a city girl whose romance with Bill turned her summer visit to Big Sur into a lifelong stay. The couple opened Rancho Sierra Mar, a small resort and café near the Post family home, which they ran with their two children, Billy and Mary. Bill Post has been in Big Sur most of his life, and there were many chores on the self-sufficient homestead. After serving in the Marine Corps in WW II, Bill came home to run the ranch. He was raising two daughters on his own when he met and married Luci. The image to the left shows Billy and his grandfather Joe.